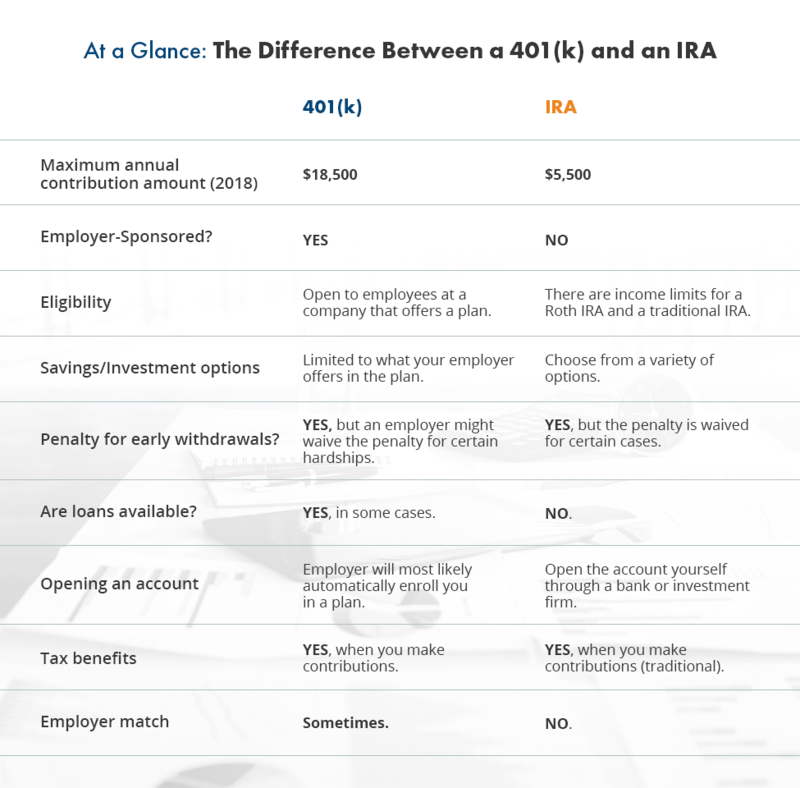 Home » About Us » Blog » 401(k) vs. IRA: Which Is the Better Choice for You? When it comes to saving for retirement, there are a lot of options available. Your new employer might have mentioned setting up a 401(k) account after they hired you. You might have heard a friend or relative talking about their IRA over dinner. How can you know which retirement plan is right for you? Your employer, your income and your personal preferences all factor into determining which retirement plan is the better choice. Learn more about 401(k) plans and IRAs and start saving for the future today. A 401(k) is a retirement plan offered by employers. If the company you work for offers a 401(k) plan, you can choose to have a certain amount of money deducted from your paycheck each period and deposited into your 401(k) account. Your contributions to a 401(k) are pre-tax, meaning you don’t pay income or other taxes on them now. Instead, you pay tax on the money in a 401(k) when you withdraw it during retirement. Depending on your income now and your income in retirement, contributing to a 401(k) plan can help to lower your overall tax bill. What sets a 401(k) apart from other investment and savings options is that you can only access one if your employer sponsors a plan. If you are self-employed or don’t have a full-time job, it is likely that you won’t have access to a 401(k). It’s possible that your company won’t offer a 401(k) plan at all, even for full-time workers. According to research from Pew Charitable Trusts, around 42% of full-time workers don’t have access to a retirement plan from an employer. It’s worth noting that, if you work for a government agency or non-profit, there is a good chance you are taking advantage of what is called a 403(b) instead of a 401(k). These types of retirement savings accounts are very similar to 401(k)s aside from the fact that they are utilized by public agencies and non-profits, making them exempt from some administrative costs that apply to 401(k) plans. Generally speaking, you contribute a percentage of your gross salary to a 401(k). However, there are limits to the total amount you can contribute, annually. For 2018, the contribution limit is $18,500. People over the age of 50 can contribute an extra $6,000 per year to their 401(k) plans to help them “catch up” on retirement savings. Since 401(k) plans are administered by your employer, they are responsible for withholding the money from your paycheck and depositing it into your account. If you want to change how much you contribute to your plan each pay period, you need to get in touch with the department at your employer that handles employee benefits. Although you as an individual are limited to contributing $18,500 per year, there is a way to increase the amount in your 401(k). Some employers offer to match contributions to a plan, usually up to a certain percentage of an employee’s salary. The amount of the match varies based on the company. For example, an employer may match every dollar you contribute up to 3% of your salary, others may offer a match of 50 cents for every dollar contributed, up to 6% of your salary. The employer match is completely optional, so each company decides its match rules. Occasionally, a company won’t match contributions at all. Others may offer a match, but only to employees who have been working there for a specified amount of time. The money you contribute to a 401(k) plan is meant to be there for you in retirement. That means there are penalties if you withdraw funds early, usually before the age of 65. If you take money out of your 401(k) before you are at retirement age, you’ll need to pay income tax on the amount you withdraw, plus a 10% penalty tax on the amount. You might also be able to borrow from your 401(k), usually up to 50% of the account balance or $50,000. You pay the loan back to the account, with interest, over time, often a period of five years. When you reach the age of 65 and are able to withdraw the money without a tax penalty, you can freely withdraw your retirement savings. This becomes taxable income unless you are using a tax-free alternative like a Roth 401(k). Once you reach age 70½ you must withdraw the Required Minimum Distributions (RMD) level each year. This is the minimum amount required by the government to be withdrawn from an account. What Happens to a 401(k) Plan When You Leave a Job? Leaving a job means that you won’t be able to contribute to that particular 401(k) anymore but doesn’t mean you will lose access to the money you saved. You have a few options when you change jobs. You can transfer the money in your old 401(k) into the plan offered by your new employer if the new employer offers a retirement plan. You can also leave the money alone, letting your investments and savings grow over time. If you choose this option, you might have to pay administration fees that your employer was paying. Finally, you can roll the money over into an individual retirement account, also known as an IRA. Like a 401(k), an IRA is a type of retirement account. Unlike a 401(k), you don’t have to have an employer to participate in one. Any person with earned income can open and contribute to an IRA. There are a few different types of IRA available. The most common options are a traditional IRA and a Roth IRA. When it comes to taxes, a traditional IRA is a lot like a 401(k). You can deduct the total of your contributions to a traditional IRA from your taxable income for the year when you make the contributions. When you are ready to start withdrawing from a traditional IRA, you pay income tax on the amount you withdraw. If you have a traditional IRA, you can make contributions to it up until the age of 70 1/2. You also are required to start taking distributions, or withdrawing money, from a traditional IRA by the age of 70 1/2. If you choose to open a Roth IRA, you pay tax on the amount you contribute when you make the contribution. Once you are ready to start withdrawing from the account, you don’t pay income tax on the amount you originally contributed or on the earnings that have built up over time. Unlike a traditional IRA, you can make contributions to a Roth IRA throughout your entire life, as long as you have earned income. Like a 401(k), you can’t put as much as you want into an IRA during the year. For 2018, the contribution limit to an IRA is $5,500 per year. People over the age of 50 can contribute up to $6,500. The annual contribution limit is per person. If you open a traditional IRA and a Roth IRA, you can save up to $5,500 total, not $5,500 in each account. Since you are the one responsible for opening and contributing to an IRA, you can decide when and how much to deposit into your account. You can set up monthly deposits, or contribute on a quarterly basis. You can also decide to make the full contribution to your account at the beginning of the year. The amounts you contribute to an IRA are meant to be used in retirement. There are penalties if you withdraw from an IRA before the age of 59 1/2. Typically, you’ll have to pay a 10% penalty tax on the amount you withdraw, and if the money comes from a traditional IRA, income tax on the amount. There are exceptions to the rule, though. Since you’ve paid tax on contributions to a Roth IRA, you don’t have to pay income tax or the penalty tax when you withdraw your contributions. You can also avoid the penalty tax if you withdraw from an IRA to pay for education, your first home or certain medical expenses. Much like 401(k)s, once you reach the age requirement to withdraw, you can begin using money from your IRA without any tax penalty, but this will be treated as taxable income unless you have a Roth IRA. Once you reach age 70 1/2, you will need to withdraw at least the Required Minimum Distribution (RMD) from your IRA just like you would with a 401(k). Aside from contributions limits and availability, there are a few more differences between a 401(k) and an IRA. Understanding the differences can help you decide which one is the right choice for you. Maximum annual contribution amount (2018): 401(k): $18,500. IRA: $5,500. Employer-Sponsored? : 401(k): Yes. IRA: No. Eligibility: 401(k): Open to employees at a company that offers a plan. IRA: There are income limits for a Roth IRA and a traditional IRA if you have a retirement plan at work. Savings/Investment options: 401(k): You are limited to what your employer offers in the plan. IRA: You can choose from a variety of options, including savings and investment choices. Penalty for early withdrawals? : 401(k): Yes, but an employer might waive the penalty for certain hardships. IRA: Yes, but the penalty is waived for certain cases. Are loans available? : 401(k): Yes, in some cases. IRA: No. Opening an account: 401(k): Your employer will most likely automatically enroll you in a plan. IRA: You open the account yourself through a bank or investment firm. Tax benefits: 401(k): Yes, when you make contributions. IRA: Yes, when you make contributions (traditional) or when you withdraw from the account in retirement (Roth). Employer match: 401(k): Sometimes. IRA: No. After looking at the differences between a 401(k) and an IRA, you might come to the conclusion that both look like good choices and you’re not sure how you’ll narrow it down. The good news is you don’t have to choose between one or the other. If you are eligible for a 401(k) plan through your employer, that doesn’t necessarily mean that you can’t also open and contribute to an IRA. You can contribute to a traditional IRA if you have a 401(k), but the amount you’re able to deduct might change based on your income. If you have a retirement plan at your job, you’re single and you earn less than $63,000, you can contribute to a traditional IRA and deduct the full amount of your contribution. If you earn more than $73,000 and have a retirement plan at your job, you can still contribute to a traditional IRA, but you can’t deduct the amount from your taxable income. If you earn between $63,000 and $73,000, you can take a partial deduction. There are also income limits for married couples who have retirement plans through their jobs. Your adjusted gross income, but not your retirement plan status, also determines whether you can contribute to a Roth IRA during the year. Single people who earn more than $135,000 per year and married couples who file their taxes together and earn $199,000 or more can’t contribute to a Roth IRA. If that’s the case for you, you can either contribute to a 401(k) if your job offers one or open a traditional IRA. If you want to save as much as possible for retirement, it makes sense to contribute to a 401(k) offered through your employer and to an IRA. If you can make the maximum contributions to both accounts, you are setting yourself up for the best results when it comes to saving for the future. But not everyone can save the maximum aggregate contribution amount of $24,000 per year for retirement. In those cases, you’ll want to look closely at your options before deciding where to put your money. Since you can have both a 401(k) and an IRA, which one makes more sense to open and contribute to first? If your employer offers a 401(k) and will match your contributions, it’s usually a good idea to contribute what you can to that account, up to the matching limit. Getting the employer match on a 401(k) is like earning bonus money. If they are offering it, it’s usually in your best interest to take it. If your employer has a 401(k) but doesn’t match contributions, it’s often best to focus on contributing to an IRA first. You usually have more investment options and flexibility for making contributions with an IRA compared to a 401(k). Whether you contribute to a traditional or Roth IRA depends on your income and what you expect your tax bill to be like in retirement, compared to today. If you think you’ll be in a higher tax bracket in your retirement years, contributing to a Roth IRA and paying the taxes now, rather than later, might make the most sense. If you think you’ll be in a lower tax bracket during retirement, a traditional IRA might be a better fit. Whether you decide to focus on contributing to a 401(k) or an IRA, you can rest assured that you are making a smart choice when it comes to preparing for the future. Retirement might seem like it’s years or even decades away, but the sooner you start planning for it, the better prepared you’ll be when it does arrive. Mid Penn Bank offers investment consulting services to clients in Pennsylvania. To learn more about our services and your retirement planning options, get in touch with us today.